Loikaw is the capital of Kayah State a hidden corner of Myanmar filled with exotic culture and raw beauty. Explore tribal villages, learning about the unique traditions of the most internationally famous ‘long neck’ people wear the brass rings around their neck. 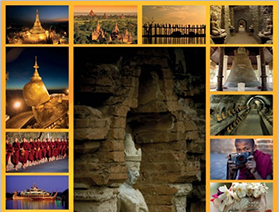 Upon your arrival in Yangon, welcome by our tour guide and transferred to your hotel for check-in. Enjoy private tour and drive through downtown to explore the city centre and its fabulous mix of architecture and sites. The streets are filled with historical buildings many of which have a faded colonial charm not seen elsewhere in Asia. You’ll start at the post office – a lovely historic building, passing by Strand Hotel, Mahabandoola Garden and Independence Monument along the way. After breakfast – pick up at the hotel and transfer to airport for flight to Loikaw. Upon arrival, transfer to your hotel. In the afternoon, enjoy your time exploring Loikaw and the surrounding area. In the center of Loikaw there is Taung Kwe Pagoda, which comprises a number of white and gold monuments sitting on top of limestone offering panoramic views of the distant plains, hills and mountains. After breakfast drive to 30 minutes outside of Loikaw to the Demawso market (only open Mon, Wed, and Sat). This local market attracts tribes from the surrounding area selling local unique items. After market visit – we will drive to the countryside for an easy walk through local villages and farmland to visit the Pan Phet village. Most of the inhabitants of Pan Phet are of the Padaung tribe. Locally referred to as “long neck ladies”, the Padaung women are famous for the many golden neck rings they wear. You are welcomed in a local home where you will enjoy a hot drink and a simple, local snack. There will be a unique chance to interact with these ladies during a stroll through the village. Along the way, your local guides will present special cultural and natural sites, which are important to local people and their way of life. Though the long neck tradition is dying out, most women over 40 in the village can still be seen wearing these heavy accessories. You may combine this tour with other packages. Loikaw is about 5 hours drive from Inle Lake. This private tour can be arranged for single traveler, couple, family and group tour. Prices vary according to hotel standard, when you travel, how many people you travel with, the level of private guiding required and the overall arrangements. Please contact us to discuss your individual requirements.